The television show Top Gear is watched by millions of viewers worldwide, and has spawned a number of international versions across the globe. Known for its smart car talk and hilarious presenters, there is another thing for which this show is remembered–its many crashes over the years. You can see a full account of Top Gear’s history of destruction here in infographic form, but for now, here are five of the most memorable Top Gear crashes. Perhaps the most genuinely frightening crash of this list, this crash in 2006 put Richard Hammond in intensive care after losing control of a jet car at 288 miles per hour. Luckily Hammond recovered, and still presents the show today. What happens when you miss your ferry back to England? Jeremy Clarkson showed us with this dramatic (and hilarious) last ditch attempt to make the boat. Over the years there has been one car that has received more abuse than any other on the show, and that car is the 70s gem, the Reliant Robin. Having been shot into space (kind of), and rolled by the Stig, one of the most memorable Robin adventures came when Clarkson took a drive around Northern England. In one memorable episode, the three presenters were asked to accelerate to 60 mph and brake quickly to save from crashing into one of their prized possessions. 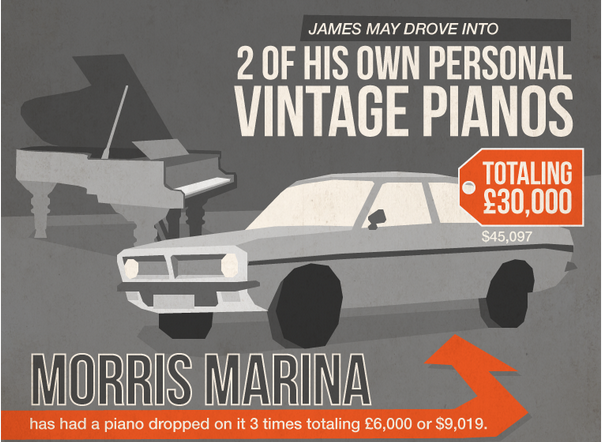 James May failed the task and ran through one of his own pianos. From the South Korean version of the show, this dramatic helicopter crash occurred during filming, miraculously resulting in no serious injuries. Check it out.